So you think you know it! 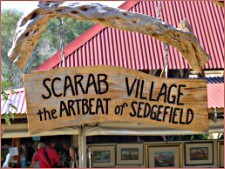 Sedgefield Village is the surprise ingredient in the middle of the sandwich. 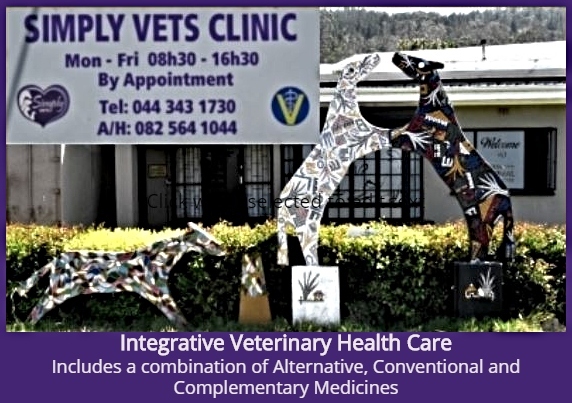 It lies unobtrusively between the better known towns of the Garden Route, Wilderness and Knysna. Happily for many, it appears as an uninviting piece of ribbon development on either side of the N2 highway. This highway links two major cities of the Cape region, Cape Town and Port Elizabeth. 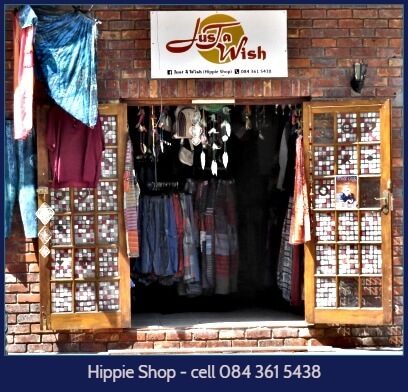 The road-side buildings – a few modest houses and unpretentious shop fronts discourage travelers from investigating it further except to refuel their tanks at one of the petrol stations and to obtain some sustenance at the adjacent convenience stores. 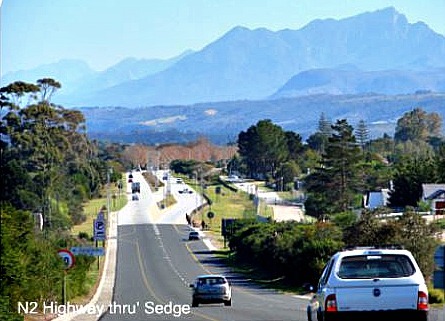 From Sedgefield village the magnificent Outeniqua Mountain range dominates the furthest distances gazing inland and in the foreground, between the sea and the mountains, the lakes, forests, rivers and fynbos-covered dune mountains crowd the landscape. 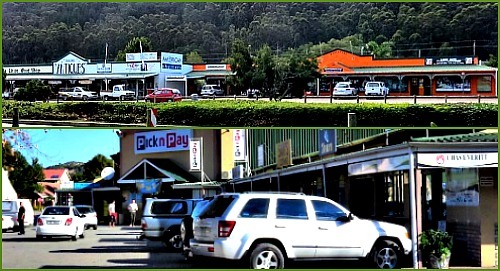 The attraction of Sedgefield village is the demure and unassuming way it blends into its natural surroundings. 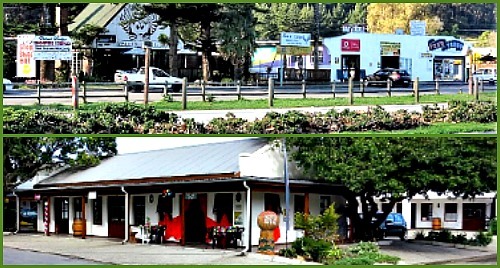 Just behind the visible mix of houses and shops that front the N2 highway, the village relaxes against the gentle curves of the Swartvlei Estuary where it broadens into a shallow lagoon before entering the Indian Ocean. The ocean is the town's southern boundary. 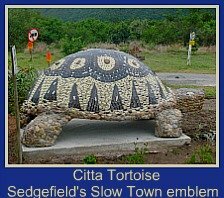 If you turn in from the N2 at the only traffic lights you will quickly discover many mosaic artworks that beautify the village. 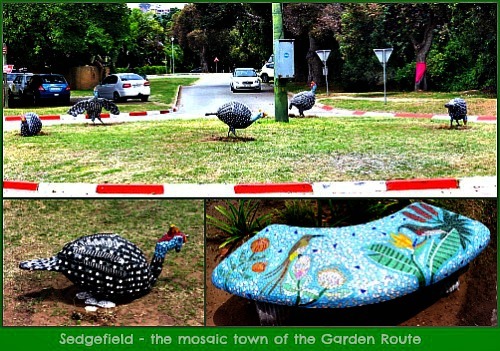 They are tourist attractions in themselves and designate Sedgefield as the mosaic town of the Garden Route. 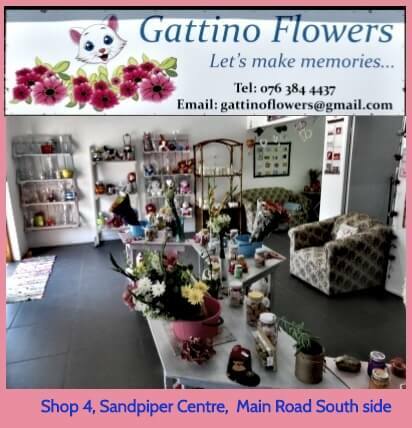 Our local NPO, Masithandane has used this project to create meaningful skills training and job opportunities for a number of previously unemployed people. The Swartvlei Lagoon and Estuary form a natural boundary on Sedgefield village's west side. Its natural eastern boundary is the only fresh water lake in the area known as Lake Pleasant aka Groenvlei and the Goukamma Cape Nature Reserve. An ancient and imposing sand dune, now covered in vegetation and forest, some of it plantation, some of it indigenous, hems Sedgefield in on the northern side. When I stand on top of this dune(see below) at a place called Cloud Nine, a popular spot for paragliders to take off from, I can see over the frontal sand-dune to a vast expanse of ocean. 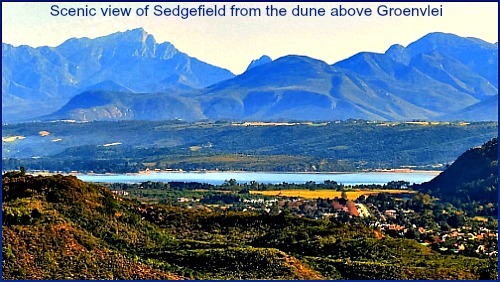 I have an impressive bird’s eye view of Sedgefield village, which seems to be nearly completely surrounded by water as the Swartvlei Lake extends behind this dune. Some thousands of years ago, the sea lapped at the foot of the Outeniqua Mountains and Sedgefield did not exist. It was under the sea. Proof of that time, is evident in the area for those interested in geology. When the sea retreated, archeological research along the present coastline shows that many places were Strandloper camping sites for several centuries. Furthermore some of the highest Dunes in South Africa are in the Sedgefield area. 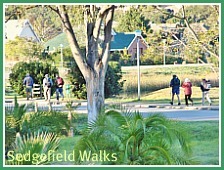 Today Sedgefield Village is home to a small but thriving community with a unique flavour due to its makeup of a fairly large contingent of retired people from all over South Africa who contribute their time and expertise in many ways to the town’s well being and to the working people that provide its infrastructure and daily services. 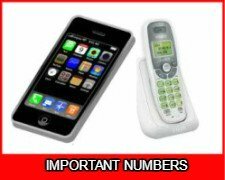 There is a seasonal influx of tourists and other visitors who maintain holiday homes here. We also receive a considerable number of “swallows”, mostly retirees fleeing from European winters to soak in our sunshine, who come and rent/own cottages/apartments in southern climes for the 6-8 months of our summer. People are friendly and newcomers are quickly made to feel at home. We are still meeting new people all the time. I’m not surprised to find many folk from all walks of life attracted to this little piece of heaven. 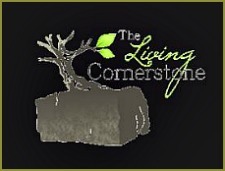 My husband and I are among those who have been drawn here. After 15 years of holidays along the Garden Route, in 2002 we bought some land, built a house on it 4 years later and mid-2007 our dream became reality – we now live in Sedgefield. 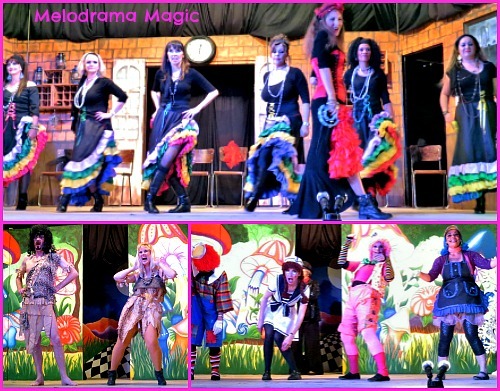 Like many small towns Sedgefield creates its own entertainment frequently to benefit many of our hardworking charitable organisations. Besides regular quiz evenings and the like, one of the most popular events is our annual Melodrama Mania that allows blatant exhibitionists to let themselves loose on the hapless less-brave locals all for a good cause. Riotous behaviour and much raucous laughter attend these occasions while a good deal of lovely lolly lands up in deserving coffers. 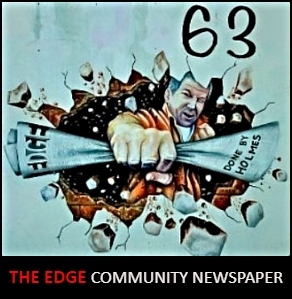 It's wonderful to live in such a caring community. Nearly everyone we chat to concedes that they are living in paradise and the longer they live here, the more they appreciate it. When I meet people who have been here for years already, I love to hear how much they still enjoy living here. I feel exactly the same. 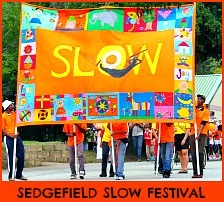 The longer I’m here, the more I love Sedgefield. 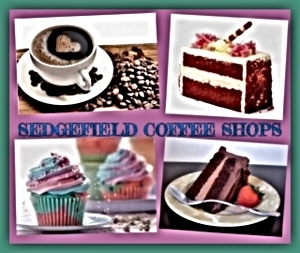 Sedgefield village has pretty much all the regular shops and facilities people need in the normal course of their daily life. There’s ABSA Bank and the other 3 main banks (FNB, Standard and Nedbank) are represented with their own ATMs, supermarkets, a chemist, several liquor stores, a greengrocer, hairdressers, hardware shops, restaurants, coffee shops and take-aways, clothing shops, health shops, gyms, doctors and dentists, veterinary services, a police station, security services, estate agents, a travel agent, stationers, computer services, a 2nd hand bookshop and furniture shop, nurseries and garden services, and two retirement homes. There are garages and car hire services. There’s a bowling club, tennis courts, a mashie golf course, a library. There’s two primary schools, but children have to travel to either George or Knysna to attend High School - not far – half an hour either way! Small town shopping also offers some unconventional surprises. For example you can buy stone ground flour and honey from Robertson's Butchery. On Fridays he sells a decent cooked portion of a meal like Chicken Biryani for a reasonable price. Marmalade, preserves and honey are sold at the laundry on the Main Road, homemade cakes, savoury tarts and biscuits at the hardware store, Build It. Courier deliveries can be sent to the local pharmacy for you to collect there if you won’t be home on the day and the tobacconist in the little mobile van on the Main Street opposite the Total Garage sells pockets of oranges and potatoes. Full take-away roast dinners can be ordered in advance (supply your own plates) for a very reasonable price from Steam Whistle-stop Station Shop for Wednesday lunchtimes. The Tuka Chicken Shop at Forest Lodge sells free-range chicken and eggs at a reasonable price. At the opposite end of town and on Main Road south side, Green Road supplies freshly picked organic veggies daily, raw honey and many other healthy products when they open at 10am. At our local Pick 'n Pay one can buy a roast dinner that includes 2 meats, rice, potatoes and 2 vegetables together with a pudding on Sundays from 11:30am onwards. If you really cannot find what you’re looking for or you simply want a day at the Mall and to take in a movie there’s no need to feel deprived on that score. Knysna is 25km one way and George is 35kms the other way, on a very scenic route either way. It’s quite easy to access some major “retail therapy”! Dogs in Sedgefield Village have the best life ever! Come rain come shine, summer or winter, dog owners take their dogs walking. We live alongside the lagoon, a popular place to walk, so we see a constant parade of walkers, early morning and in the late afternoon. Near by on the Village Green, the dogs run free and socialise. They also get to collect their p-mails, keeping up to date with the latest doggie news! Their owners look on and socialise too. 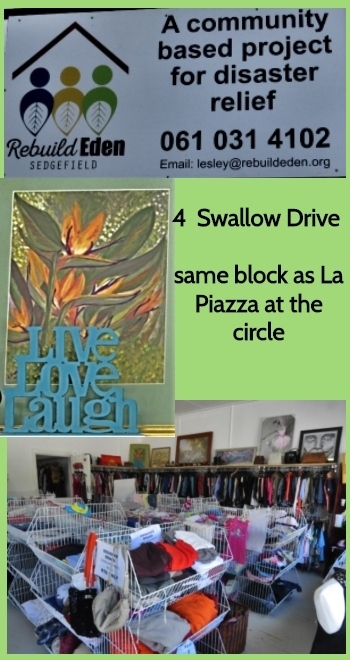 But Sedgefield village is really about the outdoors and our natural environment which we live so very close to. We feel part of the lagoon, the beaches, the forest, the mountains - its all right here - wherever you walk - you see it, feel it and breathe it and somehow, there's no other place quite like it! Dogs are allowed on certain areas of Myoli beach and have great fun playing together and fetching sticks thrown into the waves. 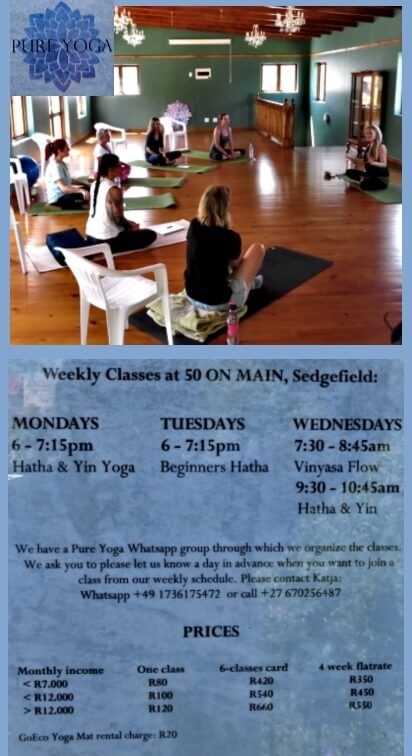 Its good exercise for them. 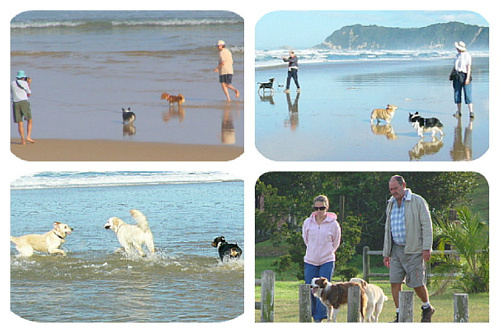 There aren't too many dogs bored with their lives in Sedgefield! 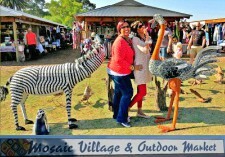 Visit Knysna is the tourism link to our parent town. 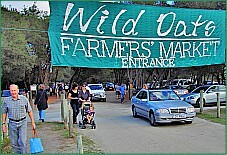 Sedgefield falls under Knysna Municipality. 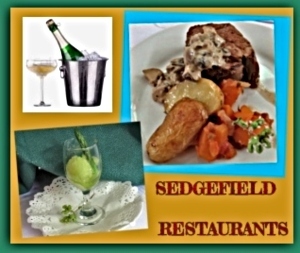 There is a wealth of information about the area on this website and it incorporates Sedgefield.